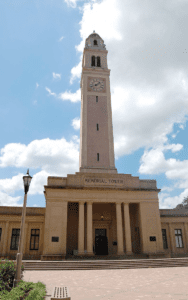 After almost a hundred years of service, the Louisiana State University (LSU) Memorial Tower in Baton Rouge was ready for restoration, but asbestos stopped the clock tower project when the potentially deadly mineral was found in the interior. The tower was built in the early 1920s in memory of 1,447 Louisiana soldiers who died in World War I. The interior of the tower houses a military museum. The Memorial Tower clock holds a special place in the heart of students and the community for its chimes. The bells ring every quarter hour until 10 pm and at noon they ring the tune of the university’s alma mater song. On Valentine’s Day, tradition states that receiving a kiss under the tower at the ringing of the chimes at midnight – the only night they ring past 10 pm – confirms a student is now an “official” LSU student. The 175’ tall building was designed in the Italian Renaissance style and is a landmark in the city. From its history, it is evident the tower is an important part of Louisiana’s past – from its construction in 1923, to today, and into the future. The restoration will ensure the building and its traditions carry on for future generations of students. Finding asbestos was not completely unexpected, as many buildings in the United States were built using the mineral from the 1920s until the late 1970s. Until renovations began, the asbestos was undisturbed and therefore not a danger. But once substances containing asbestos are handled, fibers can become airborne and inhaled by workers or others who are in the affected area. When found in the tower, work on the interior was stopped and tests are currently underway. Most other buildings on the LSU campus were also constructed during this time period, meaning that as they are restored, they may also need testing and possibly abatement. Because the asbestos was discovered at the beginning of the restoration, the university states there is no threat to students or faculty members. As a precaution, remodeling or renovations performed on any commercial buildings, schools, or residences during the time period asbestos was commonly used in construction, may require testing on possible asbestos-laden products before initiating a project. Exposure to asbestos is a known cause of cancers, such as lung cancer and mesothelioma. At this time, mesothelioma remains a fatal disease. Mesothelioma can go undetected for decades – even 50 years – which makes it a silent killer. Early detection is critical. Exterior renovations continue and the entire $6.8 million project should be completed by the 2020 Fall semester. Baton Rouge, especially LSU students and alumni, look forward to enjoying their celebrated clock tower once again. The Asbestos Disease Awareness Organization, ADAO, was the group that started it all. It began in 2004 when two people, Doug Larkin and Linda Reinstein, who had loved ones suffering from mesothelioma saw a need and worked to find a way to stop this deadly disease. They found it through the ADAO as they began spreading the message about asbestos and mesothelioma. Today is Mesothelioma Awareness Day, started by ADAO, and a perfect time to look at this amazing organization that makes fighting for past, current, and future victims of asbestos its goal. Caring for, and watching their family members die, put the founders in contact with others going through the same painful journey – a journey that could be prevented for the generations to come if the mineral at the heart of it all could be banned. Fourteen years later, it is still not banned in the United States, but is in many parts of the world. This group started slowly but gathered momentum as other victims and their family members learned of its existence. Today, thanks to people from all walks of life: patients, caregivers, and a host of donors and volunteers, the ADAO boasts a network of over 50,000 people who share in this quest to eradicate mesothelioma and other asbestos-related diseases from the world. While the ADAO does strive for a ban, their mission goes beyond that with three initiatives: education, advocacy, and community. The ADAO has gathered a built an extensive library that is shared throughout the globe, along with a website brimming with information about asbestos and what you can do. There are speakers at conferences and events around the world presenting opportunities to interact and share information with others on similar missions. Each year, the ADAO hosts its own conference, the International Asbestos Awareness Conference where the latest information on the status of prevention and treatments is shared. In 2019, the conference will be in Washington, D.C. on April 5-7. Since 2004, the ADAO has presented 13 staff briefings for the U.S. Senate and House of Representatives. They’ve created and sponsored a bill, the Alan Reinstein Ban Asbestos Now Act, that is supported by both the House and the Senate. This bill would require the Environmental Protection Agency (EPA) to finally – and permanently – remove the possibility of all human or environmental asbestos exposure. Caring for someone suffering from mesothelioma is an isolating experience. Linda Reinstein experienced that as she cared for her husband and knew it was an important part of the ADAO mission to support those with the disease and those caring for them. There are groups throughout social media to provide contacts and support without leaving home, there are campaigns, like “Share Your Story” and “6 Word Quotes” that educate about the dangers of asbestos and unite those living with the aftermath of exposure. Until asbestos is banned throughout the world and there is no one suffering any longer from this disease, the ADAO will continue to fight to educate, support, and bring the issues of exposure to those in government who can make a difference. You can sign a petition to the EPA for a final ban on asbestos, follow the ADAO on Facebook and Twitter, and get their eNewsletter – all ways to stay informed. The Asbestos Disease Awareness Organization (ADAO) takes asbestos exposure seriously as they have heard the stories of thousands who have died, and so each year on September 26th they remember asbestos victims and push forward for a ban on this deadly mineral. While many countries around the world have banned the use and import of asbestos, it is still legal in the United States. It is proven to be a cancer-causing substance for those exposed as there is no safe level of exposure to asbestos. This year the ADAO has moved from a Mesothelioma Awareness Day on September 26th to proclaiming September a Mesothelioma Awareness Month to increase the reach to people that can be educated to the threat of asbestos use and the need for caution when working with any material that may contain asbestos. How can we remember asbestos victims and push forward for a ban? • Right now you can sign a petition to ban asbestos. By clicking this link, you’ll be directed to a page where you can sign. The more legislators who see the interest of citizens for a ban, the more they can push the Environmental Protection Agency (EPA) to increase the current rules, recognize the dangers, and get to the point of an outright ban. • Join the chat on Twitter September 26th, from 12-1 PM ET. Go to #ENDMeso – for that hour, you’ll find questions about asbestos awareness as well as comments from people personally affected by asbestos exposure and mesothelioma, a deadly disease directly connected to exposure. The purpose is to create a global conversation between experts, victims, advocates, and anyone concerned about the dangers and the long delay in stopping the use of asbestos in the US. • Light a candle on September 26th for the Mesothelioma Warriors lost to the disease and those who continue to fight for their lives. • Participate in the 9th Annual Miles for Meso 5K Race and 3K Walk/Fun-Run. Last year $30,000 was raised to help fund awareness and education efforts. The race in in Alton, Illinois, but is available to anyone through the ADAO’s Virtual Team where you can join in from the front of your computer. Mesothelioma is a disease that often takes decades to appear after exposure. It currently has no cure. Because of the long lag between exposure and diagnosis, people exposed today may not develop the disease until 2050! This cycle needs to stop now and asbestos must be banned to stop it. In addition to the steps you can take outlined above, you can donate to the ADAO as a partner in the fight for a ban. You can directly contact the EPA and your legislators. You can be an advocate for the health of many by adding your voice to stop the import and use of asbestos now. We recently posted a blog about substandard asbestos abatement work at the Lafayette Academy Charter School and, at a meeting with school officials and representatives from the Recovery School District (RSD) and the Louisiana Department of Environmental Quality (LDEQ) on July 27th, it was evident that parents’ concerns over asbestos abatement continue due to the possible exposure to their children. The first abatement was conducted from March through the summer of 2017. The LDEQ inspected the work and found many faults, including children walking the halls around the work area and “sticking their heads in” to see what was happening behind the improperly installed plastic sheeting. This work was supposed to be started in May after school was dismissed for the summer. The second abatement began in May of this year. Again, LDEQ inspectors found issues with the removal process, including workers walking about the campus wearing the clothes and shoes they wore in contamination areas, thus spreading fibers wherever they walked. The plastic sheeting material was found with holes allowing asbestos to spread. The Choice Foundation, overseer of the academy, was informed on July 16th by the RSD that the abatement did not follow protocol once again. At that time, the school was closed until it is proven safe for students and faculty. Meanwhile, school officials, as well as representatives from LDEQ and RSD, continue to claim there was no risk to children during the abatements of 2017 or 2018. They stress air quality tests were far below any dangerous levels. The current abatement should be completed by mid-August, but students will not return until all buildings, contents, and grounds are declared safe which means they will be located at alternate locations throughout much or all of this coming school year. Students from pre-K – 4th are expected to attend Paul Dunbar school this coming year. The 5th – 8th grades are targeted to attend the historic McDonogh 35 building on Kerlerec Street. Parents see this as a possible extension of the problem as the McDonogh building is much older that the original uptown Lafayette Academy building and it also contains asbestos. This building is now also undergoing renovation and abatement to prepare for the new students. Though all areas are monitored each day for any sign of mishandling of asbestos-containing materials, confidence is low among parents. Construction on this building should be complete by August 13. New Orleans workers at the W.R. Grace vermiculite exfoliation plant were exposed to asbestos from 1965 to 1989. The facility is located in Jefferson Parish on River Road. During this time, the plant received 148,000 tons of asbestos-contaminated vermiculite from the Libby, Montana mine, also owned by W.R. Grace. The vermiculite mine in Libby operated from the early 1920s until 1990, producing over 70% of vermiculite sold in the U.S. Though vermiculite is a naturally occurring mineral – in appearance, much like mica with multiple shiny layers – it was contaminated with asbestos in the Libby mine. W.R. Grace both mined and processed the ore and then shipped to locations all over the United States, including Louisiana. Inhalation is the primary means of exposure to asbestos. As tons of vermiculite were shipped to a location, processed, and shipped out to other locations, the ore released asbestos fibers into the air. These could also be released during the mining, milling, and exfoliation operations. Though workers were the most susceptible to exposure, people in nearby offices and residences could also be exposure, as well as their family members. In the case of W.R. Grace in New Orleans, there is a residential area a few hundred feet northeast of the site. The W.R. Grace plant was an exfoliation facility. That process required vermiculite to be heated to high temperatures. The water contained in the mineral converted to steam and then separated the mineral into its layers, expanding the vermiculite into small worm-shaped pieces. By doing this, its bulk volume was expanded, or “popped,” and the mineral became a commercially valuable product – primarily for attic insulation, concrete aggregate, masonry insulation, horticultural soil conditioner, and a spray-applied fireproofing. But, in this process, asbestos was released and made available for human exposure. There was a population of 5,047 within one mile of the facility in 1989, the time production ceased. Jefferson Parish still ranks 19th among all U.S. counties in deaths from mesothelioma. W.R. Grace reported that at the time operations ceased, a remediation was conducted at the site including vacuum and water rinse of equipment, walls, and floors, and removal of equipment. Diseases from asbestos exposure, such as mesothelioma, can take up to 50 years before symptoms appear. It has only been 30 years since Libby vermiculite processing ceased. If you think you were exposed, the first precaution would be to stop smoking as that can aggravate any potential lung disease. It would also be prudent to let your doctor know the timeframe and degree of exposure you experienced and have regular checkups. Exposure from working with a product containing asbestos, such as Libby vermiculite, dramatically increases the risk of disease. The sad truth is that those exposed to vermiculite had no idea they were inhaling fibers that would potentially shorten their lives.